Splatoon is a third-person shooter video game developed and published by Nintendo for the Wii U. 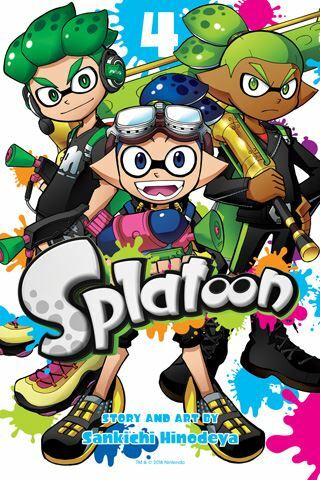 Released worldwide in May 2015, Splatoon centers around characters known as Inklings, beings that can transform between humanoid and squid forms. They hide or swim through colored ink sprayed on surfaces using guns, buckets, or brush-based weaponry. There has been manga (Japanese comics) based upon the game. VIZ Media is currently publishing the Splatoon manga produced by creator, Sankichi Hinodeya, in English in graphic novel form. Hinodeya's manga focuses on Team Blue, which is comprised of the Inklings: Goggles, Bobble Hat, Head Phones, and Specs. Splatoon, Vol. 4 (Chapters 12 to 15) opens as the preliminary rounds of the Square King Cup end. Our heroes on Team Blue must go into battle (called a “turf war”) against two opponents in order to get through the main round and into the semifinal round. First is “Team Inkfall,” and next is “Team Outcasts.” Team Outcast is quite serious about battles, but will that seriousness mean anything to the best team in the tournament, "Team Emperor?" THE LOWDOWN: I guess I could warm up to the Splatoon manga. My VIZ Media representative often sends me VIZ titles for review that are based on video games, and I usually enjoy them. I was not crazy about Vol. 2, but I am familiar with Splatoon because my niece is a huge fan of the game. Splatoon Graphic Novel Volume 4 is an enjoyable read. I am surprised that I think so; this is really a middle school graphic novel series. This volume, however, is very much a battle manga extravaganza, without the intensity of most battle manga. I still think that this should be a full-color comic book, but creator Sankichi Hinodeya makes use of this quirky concept to create an occasionally surreal comic book. And these weird characters are sometimes endearing. I READS YOU RECOMMENDS: Fans of Splatoon may want to try the Splatoon graphic novels.